We decided to revisit last years venue, maybe because our trips along the Peddars Way always start with Castle Acre ford. 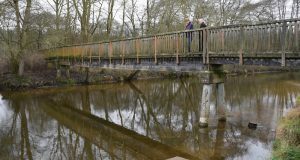 Last year the river was in flood and not passable – well not if you wanted to keep your feet dry! We hoped for better luck this year. Or maybe it was because we had such a lovely lunch at St Georges Distillery and a cheeky bottle to take away. However, the decision was made and we headed to Thetford. Day one and we immediately achieved our first goal, dipping our toes in the ford at Castle Acre. We think the water was as much as half a metre lower than last year. We headed up the Peddars Way towards Holme-next-the-Sea. The sun came out as we approached Bircham Windmill lighting it and the field around and then again as we turned the corner near the coast and it lit up the off shore wind farm, making the turbines glow on the horizon. On day two we ate breakfast in the Kings Forest and crossed the River Thet at another ford that was too deep last year. Our final day started with a look at Santon Downham on the Little Ouse River. It was close to some lanes and had parking and a foot bridge across the river. The information boards there told us of “the Great Sand Flood of 1665” a phenomenon that shifted sand hills across fields and overwhelmed the village. After a few more Kings Forest lanes we crossed the railway on the level crossing at Shadwell. An adventure that meant we had to use the phone to check that we had enough time to cross. We had a superb few days away the scenery was fabulous with some fantastic colours from the dried bracken and some almost purple colouring in the massed dried stalks between the Silver Birch trees.